Start module Create a new portal General settings / Click on "Next" and continue to "Summary"
Start module File menu / New portal General settings / Click on "Next" and continue to "Summary"
Portal menu / Import portal General settings / Click on "Next" and continue to "Summary"
Portal Builder General settings / Click on "Next" and continue to "Summary"
Opens a dialog where the portal name and directory can be modified. Opens a dialog where the web server settings can be modified. 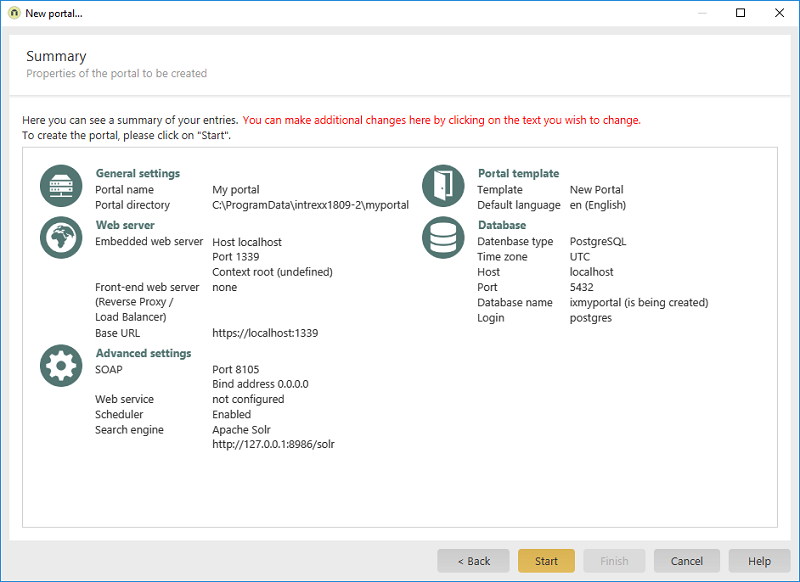 Opens a dialog where the portal template can be modified. Opens a dialog where a different database can be selected. Opens a dialog where the ports, search engine and other settings can be modified.